Bike-sharing services, electric bus fleets, restored sidewalks. There are plenty of examples of how cities around the world can use improved transportation and mobility infrastructure to address climate change. But according to the new report, Cities100, released by sustainability think tank and consultancy Sustainia, cities are increasingly harnessing these same types of green transportation initiatives and using them as tools to alleviate and mitigate engrained social inequalities. Socioeconomic inequality takes very real and physical shapes in cities around the world. Poor and minority communities tend to be more physically cut-off from economic hubs, educational institutions and healthcare, making access to these opportunities and services more time consuming, expensive and all around more challenging. This trend only threatens to worsen in coming years, as cities will hold more than two-thirds of the world’s population by 2050, putting more pressure on housing and transportation infrastructure. But if distance is part of the equity issue, then innovative approaches to transportation can be the solution. One city featured in this year’s Cities100 that is acutely aware of the devastating consequences of segregation is Cape Town. In an effort to alleviate the lingering physical and social effects of Apartheid, Cape Town’s Transit Oriented Development Strategic Framework seeks to make transit-oriented development (TOD) the centerpiece of future land-use management and growth. TOD ensures that residential and commercial development take place alongside transit systems in a strategic effort to build compact and walkable cities and promote affordable access to public transport. The city hopes this strategy will lead to a 23 percent reduction in passenger kilometers traveled by 2032, as well as decreased transport costs, particularly benefiting low-income groups who currently spend 43 percent of their income on transport. Another city using transport overhauls as a tool in catalyzing upward mobility is Mexico City. The Comprehensive Mobility Program represents a paradigm shift in the city’s approach to urban planning, prioritizing pedestrians, cyclists and public transit-users. One of the program’s key goals is to reduce traffic congestion. Cutting gridlock via greener and better connected transportation networks, including the construction of 110 km (68 miles) of bike lanes, will have a particularly profound impact on the city’s low-income and peripheral residents, who can spend as much as three hours commuting – each direction. For many, this adds up to a full 26 days a year spent travelling to and from work. As studies in the U.S. have illustrated, commuting time is the single strongest factor in the odds of escaping poverty. Therefore, by shrinking commuting times for low-income earners, Mexico City aims to not only tackle CO2 emissions, but also boost social and economic prospects for vulnerable citizens. 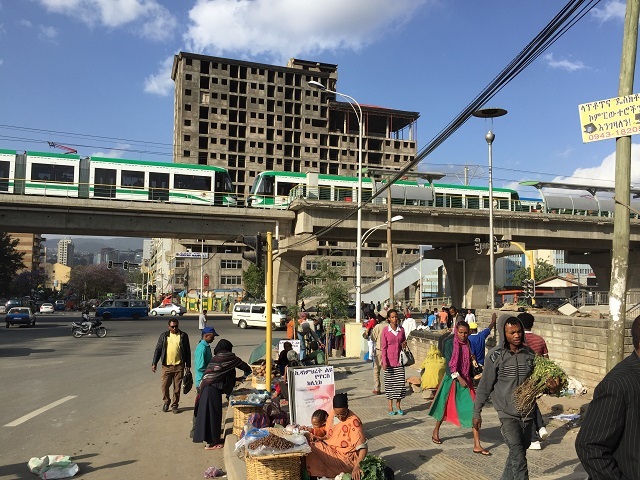 In another corner of the world, the Ethiopian capital of Addis Ababa is just starting out on its path toward sustainable and equitable transportation. In 2015, the city inaugurated Sub-Saharan Africa’s first light-rail train (LRT) network, covering 34-km (21 miles) and carrying 15,000 people each hour. With fares as low as $0.30 per trip, the LRT is designed to cater to middle- and low-income commuters who would otherwise take minibuses on congested roadways or walk long distances to reach their destinations. This low cost is crucially important for the city’s job seekers, as new research shows that access to cheaper transport in Addis Ababa helps unemployed residents search more intensely for new jobs, and increases their probabilities of finding stable employment. On top of offering low-cost, high-quality transit, the LRT is laying groundwork that can sustainably and equitably accommodate the city’s growing population, by providing major transit corridors, which can foster future transit-oriented development. These cases demonstrate how connected and cohesive urban transportation is not only a critical element for cutting CO2 emissions, but also a necessary tool in mitigating socioeconomic disparities in cities around the world. By taking a holistic approach to urban planning, and viewing transportation infrastructure as an avenue towards equitable growth and development, more cities will be able to reconnect and revitalize poor communities and give access to the kinds of economic opportunities that can lead to social change on a larger scale.